For more than a decade, Spira, a Boston University School of Medicine (MED) professor of medicine, pathology and laboratory medicine, and bioinformatics, has been developing molecular tests to detect lung cancer early, without invasive biopsies. The work has been done together with Jerome Brody, MED professor of medicine, and Marc Lenburg, MED associate professor of medicine. In May 2015, the molecular diagnostics company Veracyte, Inc. released a new, noninvasive test for the disease based on biomarkers developed by Spira and his collaborators. The test, called Percepta™, fared well in clinical trials and could be available to patients in less than a year. The results of the trials were announced in the New England Journal of Medicine on May 17, 2015. Spira, who is also a pulmonologist at Boston Medical Center, has wrestled firsthand with the difficulty of early detection. “It’s a growing problem in our clinical pulmonary practices: smokers, either current or former, have something abnormal found on a CT scan of the chest, and we’re worried it might be lung cancer,” he says. 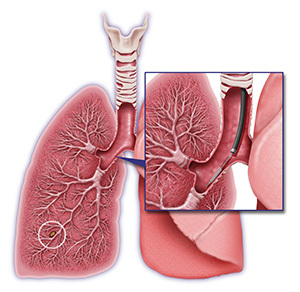 A doctor may follow up with a bronchoscopy, a minimally invasive outpatient procedure that allows the doctor to examine a patient’s airways with a flexible tube. During the Percepta test, which is performed at the same time as a bronchoscopy, the doctor uses a small brush to sample normal-looking cells in the upper airway, which are then sent to a lab for genetic testing. Spira discovered that these cells, while appearing healthy, are in the “field of injury” damaged by cigarette smoke and contain genomic markers that signal a high likelihood of cancer elsewhere in the lung. The 23 markers in the test indicate different things: some show protective genes being turned off, while others show genes associated with cell growth being turned on. The Percepta test is not yet widely available, nor is it covered by insurance. Veracyte has launched the test in an early access program, offering it in a limited number of medical centers in the United States to gather feedback on how the test is used and its clinical impact. If this trial launch is successful, the Percepta test could be made widely available in early 2016. This BU Research story was written by Barbara Moran.